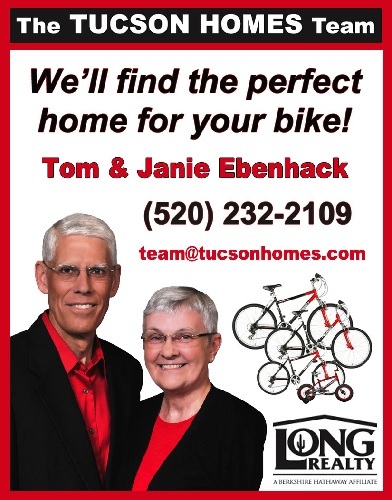 Cave Creek Information Page - Greater Arizona Bicycling Association, Inc.
Saturday and Sunday, Sept 21-22, 2019. Distance: 30 Mile and 50 Mile. The Cave Creek Canyon Overnight Ride is a ride that we hope will encourage you to take the time and explore the Cave Creek Canyon area, along with the other points of interest listed below along the route. Cave Creek Canyon is known as a birders paradise as well as a great place to go for a hike. There are many trails and unique features to see in the canyon. The Cave Creek route is also a great introduction to bike touring. If you are planning a self-contained bike tour in your future, why not pack up your panniers, get your bike ready, and join us on the 30 mile ride over rolling hills to the SW Research Station. 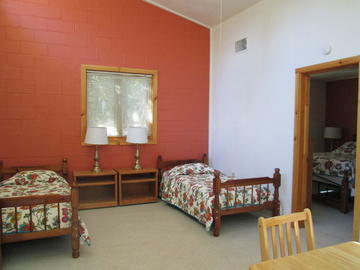 Stay in a Dorm room or camp on the grounds of the Research Station. 1 tent per site, 2 people per tent. Meals are provided and a fully supported ride. It's a great opportunity to get that first fully loaded ride in. Rider Check In Time: Updated! 9:00 am check in, LOCAL TIME at Animas High School, New Mexico. Be on the road by 10:00 am to arrive at Research Station around noon. Don't forget that New Mexico is an hour ahead of Arizona. Drive time to Animas High School at 1 Panther Blvd, NM, from Tucson is approx a 3 hr drive, 164 miles. No SAG Stop will be provided for the 30 mile route. The 50 mile route, will have a Roving SAG. Lunch provided on the lawn at the Research Station between 12:30 and 2:00. Sunday start time is 9:30 am, please be back to Animas High School by 2:00 pm. Check in by 10:00 am, be on the road by 10:30 am to arrive by noon. This route can be an Out & Back for Saturday and Sunday or can be ridden in combination with the 30 mile route. Let Ride Organizer know. Check In by 9:00 am, LOCAL TIME, be on the road by 9:30 am. Remember, New mexico Time is an hour ahead. Detail: Cave Creek 50 mile plus Day 2 Route and 50 mileRidewithGPS. GABA has reserved the Dorm at the SWRS. Some rooms have two beds, other rooms have three beds, we plan to place couples in the rooms with two beds, and others will room together with three beds. If you are camping, there are 6 tent sites, one tent per site and two to a tent. GABA will transport your tent and gear along with your bag to the SWRS. Bedding and towels are provided by the SWRS if you are staying in the Dorm. The Research Station does request that you strip down your bed in the morning before you leave. Place all linen in the pillow case and place on the bed. We'll provide lunch on the lawn at the Research Station between 12:30 - 2:00. In the past, some elected to eat in Portal on their own. We'll provide some snacks, sodas, and energy drinks for happy hour around 4:30. Those who wish may bring a small cooler with wine, beer or other beverages. It would be excellent if riders can consolidate items in coolers at the start, so thatwe don't have to haul 20 coolers in the van. Dinner is prepared by the Research Station and will be served at 6:00 pm. Breakfast will be served at 7:30 am. You'll be able to make a bagged lunch after breakfast for the end of the ride on Sunday that will be carried in a cooler for you. Cave Creek Overnight Ride Home Page. Register Now! Mountain Valley Lodge in Rodeo, New Mexico. This lodging is 20 miles from Animas High School where the Cave Creek Overnight Ride starts and ends. Mountain Valley Lodge. Cave Creek Canyon has camping on Forest Service campsites. First come, first serve. There are three campsites to choose from, Sunny Flats, Stewart campground, and Idlewild Campground. www.fs.usda.gov/coronado. Animas, New Mexico is a ranching community with some services to include a gas station and a small grocery. The Chiricahua Desert Museum - open daily from 9 am to 5 pm. Cave Creek Canyon Visitor Center - open daily from 9 am to 3 pm. 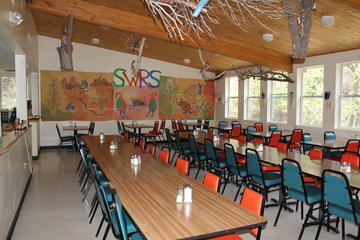 The Southwestern Research Station has many opportunities for groups or individuals. Check out "Fun in the Sun" and "Visit/Tours" on their website, Southwestern Research Station.